The crockpot doesn’t always get a lot of play on the weekends as it has a reputation of being used exclusively for Monday-Friday (aka. boring) dinners. But I think it’s actually a great idea to prep yourself a simple crockpot meal on a Friday so that you can something wholesome and delicious in the fridge before the busy weekened hits. For me, having food like this prepared at home helps me avoid mindless spending on lunches and dinners so I can save your pennies for the fun stuff like cocktails, movies, galleries, concerts and general weekend fun and/or debauchery. As an added cost-saving bonus, this was a great way to turn my two organic, free-range, locally sourced and ridiculously expensive chicken breasts into 4 meals rather than two by adding vegetables and protein-rich white beans. Dredge chicken breasts in flour mixed with a little salt and pepper. Add to a slow cooker. 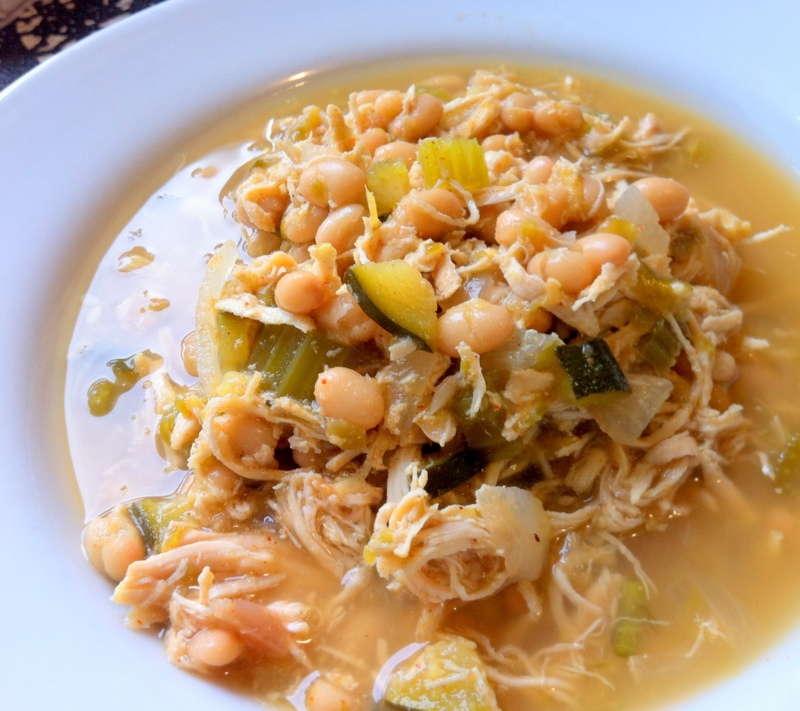 Cover chicken breasts with veggies, beans, seasonings, vegetable broth & crushed tomatillos. Cook 4-5 hours on high or 7-8 hours on low. Remove chicken about 30 min- 1 hr from the end of cooking and shred in a bowl using two forks. Return to crockpot. Serve with nachos, on brown rice or on a bed of lightly steamed kale. Top with salsa, greek yogurt, hot sauce, fresh cilantro or cheese. That’s a very nice looking plate of food.